These five- to 10-minute videos are designed to help dental or health care professionals and students understand the basics of EBD. This video series is supported by an unrestricted educational grant from Colgate. These videos demonstrate how clinicians can perform clinical procedures that align with the recommendations contained within clinical practice guidelines developed by the ADA Center for Evidence-Based Dentistry. These presentations provide an overview of evidence-based dentistry and some of the statistical concepts involved in its practice. This series is designed to help you more fully understand what evidence-based dentistry is and how to apply scientific evidence to your practice. Lesson 1: What is EBD? In this lesson, you will learn that evidence-based dentistry (EBD) is a three-part approach to making clinical decisions. It includes (1) an understanding of the patient's treatment needs and preferences, (2) recognition of your own clinical expertise, and (3) evaluation of the best available scientific evidence. 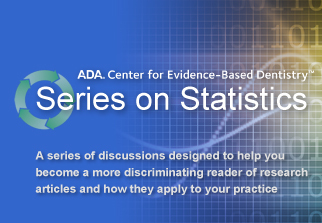 This module consists of five tutorials and is designed to provide a basic understanding of the statistics-related concepts you will encounter in evidence-based research and systematic reviews. Lesson 1: What is null hypothesis? In this lesson you will develop a null hypothesis and recognize the null hypothesis in systematic reviews. Lesson 2: Why do we need statistics? In this lesson you will describe three situations that can be quantified using statistics and identify what the authors of a systematic review are trying to quantify. Lesson 3: What are the different types of data? In this lesson you will distinguish between nominal, ordinal and quantitative data as well as identify the type of data being presented in a systematic review. Lesson 4: What is a p-value? In this lesson you will learn that the p-value is a mathematical expression of the strength of the evidence against the null hypothesis. Lesson 5: What is a confidence interval? In this lesson you will learn that confidence intervals are a range of values that give a clear idea of the magnitude of any potential clinical benefit. A broadband internet connection is needed for a smooth playback experience. If your broadband connection isn’t fast enough, the videos may stutter. If you experience stuttering or choppy playback, try pausing the video until the buffer is full and then play the video. This page works best with Internet Explorer 8 and above, Firefox and Safari. Please upgrade to the latest version of your browser for an optimal playback experience.